If there's one face that's been consistent with the growth and maturation of BPO over the last decade you'd have Accenture's Mike Salvino right up there in the Hall of Fame. (In fact... he did recently get inducted into the IAOP Outsourcing Hall of Fame). 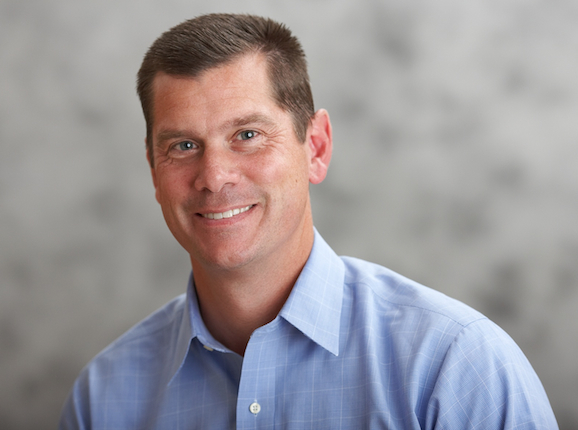 Having begun his career with Accenture’s ITO business in the late 80's and 90's, Mike spent time on the BPO front lines with one of the industry’s first pureplay BPO providers, Exult and its eventual acquirer Hewitt, before finding his way back to Accenture in 2006 where he led their F&A business before taking full responsibility for the company’s entire BPO function, where, today, BPO proudly stands as one of the firm's major divisions and strategic focal areas, alongside the firm's technology growth platform and consulting businesses. Phil Fersht (CEO, HfS): Good afternoon, Mike, thanks for joining us. So your focus on “BPO Generations,” has really become written into BPO industry lore since you articulated it three years' ago. You were one of the first to map out the stages the industry needs to go through to be successful with your “Generations” continuum and our new research (see report) shows that buyers are carrying stock in what you call “Generation Three” (Opex) and around half of them expect to be in “Generation Four” (Insight) in a couple of years. Is this realistic, in your opinion, based on the quality of today's relationships and can both buyers and providers to up their game? Mike Salvino (Group Chief Executive, BPO, Accenture): Yes, Phil, I do think it's realistic. Let me first start with where we've come from because I think that will help us understand why I think it's possible for the industry to move into the fourth generation in the next few years. We have achieved a lot over the last 25 years and we’ve finally built the industry that we wanted way back in the early 90s. If you think about the industry as a mountain range—we've climbed to the peak of one mountain and at that peak I think that we can give ourselves credit for a trillion dollar industry. We can give ourselves credit for global operations – and that's really third generation BPO. We've achieved silent running, we've achieved the ability to process transactions and we've been able to do it with a 24x7 mind set. The other thing that's really key at the top of that first mountain, and with third generation BPO, is that we have achieved client confidence. Clients now can look at providers and say "Yes, I can count on them for cost savings." Clients today can also depend on this sourcing model to be scalable, meaning we have the ability to scale up and scale down while managing risk. 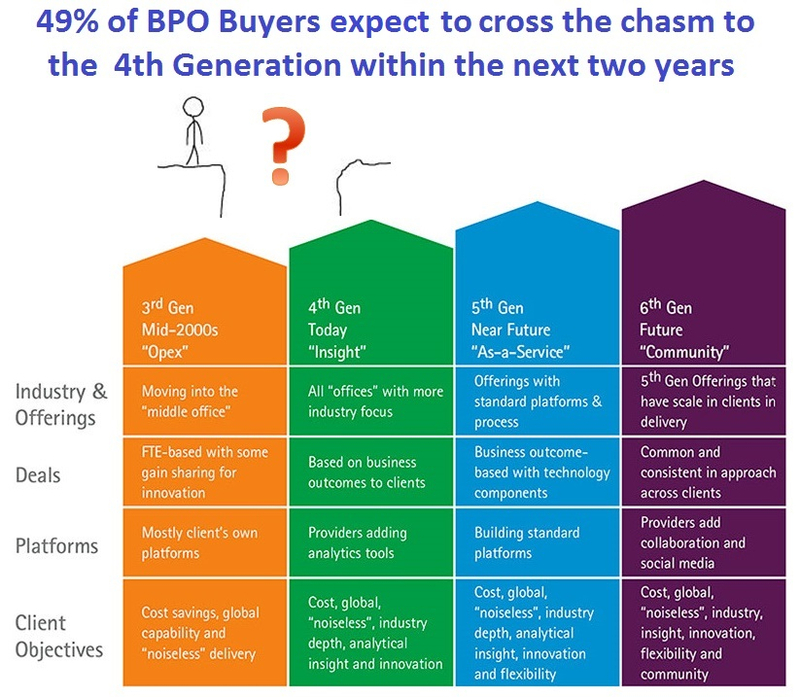 And last but not least, I think we have proven out that third generation BPO works for back office functions like F&A and procurement and also industry-specific front office processes like healthcare and mortgage processing. Now, having said that, most deals still start with us wanting to manage the risk, get the client cost savings and just get the transaction processed appropriately. The sooner we can move through that, I think the better off we’re going to be. If we turn our attention now to the real industry opportunity, which is to get to the peak of the second mountain and move into the fourth generation of the market, we need to focus on producing real business outcomes. The only way you can do that is if, on top of all that transaction processing, you really have analytics, if you really have industry knowledge and if you really know how to take that information and get it into the hands of somebody that can create the business impact. What I mean by that, Phil, is so many times I think we do come up with good analytics off of the transaction processing and we do have really good industry insight based on those analytics. But if we don't get the information into the hands of the right people then it goes nowhere. In this day and age of technology, specifically with mobile apps and social media, we should be able to get that information into the right hands. So that’s what is needed to cross that chasm between the two mountains, or third and fourth generation outsourcing, and a long winded way of saying I think we can do it. Clients may not start there all the time, they may start in third. But I think throughout their journey of outsourcing, everybody will want to aspire to get to fourth gen. It will be a journey but the industry is getting there. Phil: This takes me to the issues around how we can develop BPO as a career. 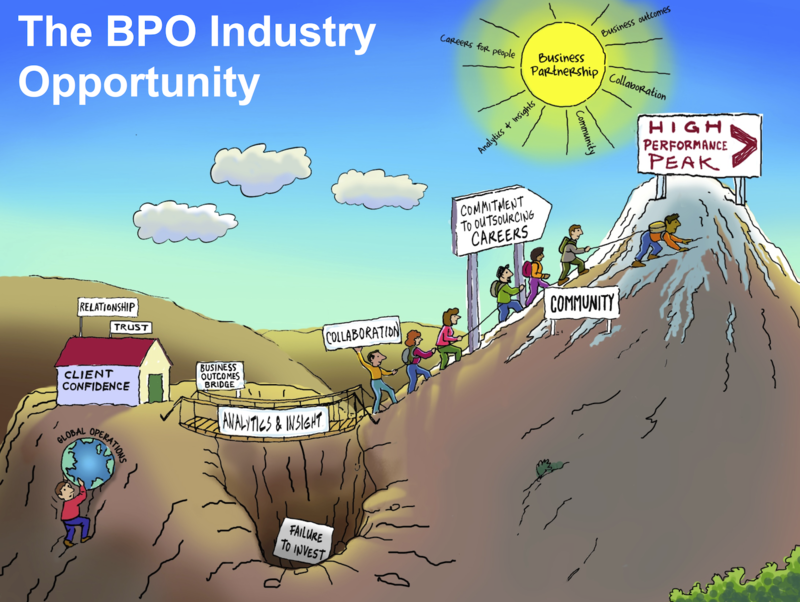 Do you think there needs to be more focus on BPO as an actual profession as opposed to a job, and do you think that's at the core of a lot of these change issues clients are tackling right now? First, and amazingly, two thirds of all outsourcing buyers are struggling to achieve any business value or outcomes beyond cost reduction and efficiency. Second, and maybe equally as startling, barely one third of buyers believe their governance teams can define business outcomes, or have the necessary analytical skills to drive innovation. The third key point is that fewer than half of buyers train their outsourcing teams in continuous improvement, and only a quarter train their people in analytics. The fourth point is key as well. It’s not just training that’s the problem – the lack of career paths for outsourcing managers is creating high attrition. It’s not a flattering picture. I think there are three steps that we need to take with our people to address these challenges and move the industry forward. The first thing that we need to do is invest in training our people. Our people need broader skill sets and deep industry and functional knowledge, not just processing skills. They need to be fluent in key technologies that are driving services today, like analytics, cloud, social and mobility. We need to train them in global operations and in what I call "change management," or the ability to get the information into the hands of the right people. These are skills anyone entering business today would want to have. The second thing is to inspire people to have a career in outsourcing and to understand their career path. They need to understand the timeline it takes to become an outsourcing professional and then how to do it. So it could be you come out of graduate school, after two years you're a global operations and functional expert and after five years you know global operations and functions and you may know analytics. After seven years you're running teams and after ten years you're running a business. I think the need is very clear and people want to hear it, from both buyers and providers and analysts, no matter where we are: the industry needs career path. We've got to be clear about what I call "recognition and rewards," and the titles that people will have along the way because those are very important to folks. We also have to be clear about their pay and how to achieve more pay when they perform. Seventy percent comes from doing. We've got to create an environment where people can do, where people can learn, where people can apply the training they’ve been given. And they're going to fail. It’s important to have the kind of environment where people are allowed to do that. If you watched the Olympics, you can't tell me that the people doing the half pipe haven’t fallen so many times that they're just tired of it. It only takes one or two times where you nail it to remember what’s right, that it feels good and you can move forward from there. So you've got to create an environment where people can “do” and that's 70 percent of the learning. The other 20 percent is coaching and so many times that's where a lot of the senior folks in the industry come in. They need to coach their people, be transparent and be direct. The last 10 percent is the training. In addition to these three steps, I’ve found was there's also an intangible. People call it “authentic leadership.” You have to make sure that people are engaged and that they know that you care about them both professionally and personally: you care about what they’re doing in their community and their careers. At Accenture, we created a rally cry called “Grow BPO.” Grow BPO is not a campaign, it's not a project, it's not an initiative. It's a mindset and it stands for growing the business, growing yourself and ultimately, growing others. When we launched four years ago we focused on helping people find balance in their lives and taking time to recharge their batteries. We made it a priority that you didn't end focus on your personal life and we thought that if you were good in your personal life you would be even better at work, and you know what, I can't tell you how well that worked. The second year of this mindset we focused on the theme of “Pass It On,” to encourage people to give back and share what I like to call their time, treasure and talent both inside the organization and externally in the community. It could be that you were going to have a brownbag lunch with people on your team or it could be going and building houses for Habitat for Humanity. That's when the mindset really kicked in. Last year our focus was called “BPO and Me,” and we talked to all 57,000 BPO employees about their career paths and we celebrated the diversity of talent that we had. This year we’re focused on the theme of collaboration and the notion of “Connected BPO” to drive better teaming internally, with folks in the industry and with clients. So my point in all this is, if we’re going to cross the chasm and seize the opportunity before us to grow the industry, we need to make outsourcing a career people are attracted to. It needs to be viewed as a unique and rewarding opportunity for people to grow and apply their skills, to do interesting work with top global clients -- helping them innovate and transform and become high performing businesses.